11 Fascinating Facts About The Song "I Will Always Love You"
Whitney Houston almost didn't record her signature song. And Elvis almost owned it. 1. The song was first released in 1974. "I Will Always Love You" was the second single released from Dolly Parton's 13th solo studio album, Jolene. 2. Although it’s a love song about a relationship, it is not about two lovers. The song isn't about two lovers or a marriage breaking up. Written in 1973, it is actually about Dolly parting ways professionally with her partner and mentor Porter Wagoner. Dolly owed all her early success to Porter. In 1966, he cast the then-obscure singer on his popular television program, The Porter Wagoner Show, and the two became a well-known vocal duo throughout the late 1960s and early 1970s. 3. Elvis Presley almost did a cover of the song. Elvis was a big fan of the song and wanted to do a cover. This news, of course, thrilled Dolly, but once she spoke with his manager, Colonel Tom Parker, he told her that in order for Elvis to record the cover she would need to sign over 50% of the publishing rights to Elvis. Dolly refused — she had a policy against signing away her publishing rights — and Elvis never recorded the cover. That decision, according to Dolly, was difficult. She said: “That broke my heart, because I loved Elvis. I cried all night. Other people were saying, 'You're nuts. It's Elvis Presley. I mean, hell, I'd give him all of it.’ I said, 'I can't do that. Something in my heart says don't do that.' And I just didn't do it, and they didn't do it." Dolly's decision not to sign over her publishing rights has made her millions of dollars in royalties from the song over the decades. 4. The song went No. 1 twice on the U.S. Billboard Hot Country Songs. The song went to No. 1 when it was originally released in 1974, and again in 1982, when Dolly re-recorded it for the soundtrack to her movie The Best Little Whorehouse in Texas. This made Parton the first artist to earn a No. 1 record twice with the same song and the same singer (and three times as a writer). 5. Linda Ronstadt was the first artist to release a cover of the song. Linda Ronstadt recorded her version for her 1975 album, Prisoner in Disguise. 6. The first inclusion of the song in a film was in 1974. Dolly's original version of the song appeared in Martin Scorsese's Alice Doesn't Live Here Anymore. Whitney’s cover of the song wasn't supposed to happen; she had originally planned to cover Jimmy Ruffin's "What Becomes of the Brokenhearted" as the theme song for The Bodyguard. Early into production, it was discovered that “What Becomes of the Brokenhearted” had just been used in the film Fried Green Tomatoes. Kevin Costner (who was also a producer on the film) suggested the song be replaced with "I Will Always Love You,” bringing in Linda Ronstadt's version of the song for Whitney to hear. Whitney loved the song and worked with producer David Foster to rearrange the tune into more of pop-soul ballad. Of course, the song was a huge hit; it spent a then record 14 weeks at No. 1 on U.S. Billboard Hot 100. "I Will Always Love You" has since become Whitney's signature song. 8. The Bodyguard: Original Soundtrack Album is the best-selling soundtrack of all time and one of the best-selling albums of all time. On the strength of Whitney’s cover of “I Will Always Love You,” the soundtrack went on to sell over 45 million copies worldwide and is the best-selling soundtrack of all time. 9. In the early '90s, the tabloids reported that Whitney and Dolly were in a huge feud. After Whitney Houston's cover became a massive hit, the tabloids reported that the two were in a huge feud; they claimed Dolly had reneged on an agreement not to perform the song while Whitney's version was on the charts. Both Whitney and Dolly have gone on record saying this was not true. 10. 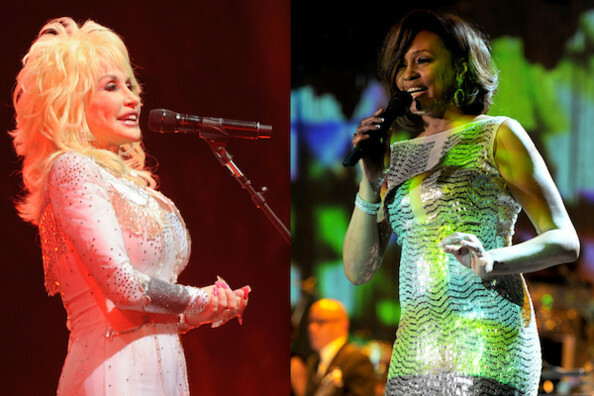 Dolly has always praised Whitney’s version of her song, as it helped introduce her to a new generation. Dolly said in a statement to Billboard, on Whitney's passing, "Mine is only one of the millions of hearts broken over the death of Whitney Houston, I will always be grateful and in awe of the wonderful performance she did on my song and I can truly say from the bottom of my heart, 'Whitney, I will always love you. You will be missed.'" 11. In 2012, "I Will Always Love You" returned to the Billboard charts. Hours following Whitney’s death, "I Will Always Love You" topped the iTunes Charts. The week after the singer passed, the single returned to the Billboard Hot 100, after almost 20 years, debuting at No. 7. The song eventually peaked at No. 3. Whitney’s version of “I Will Always Love You” has sold over 20 million records worldwide as of January 2013, making it the best-selling song by a female artist of all time as well as one of the best-selling songs of all time.